The estate, built for the Guaty family, is 4,619 square feet under air with views overlooking the 14th hole of the Talis Park Golf Course. Designed by Joe McHarris of McHarris Planning and Design, the home features four bedrooms and four-and-a-half baths, as well as a spacious three-car garage. Inside, guests are greeted by a stunning foyer, with a wall of glass looking directly onto a remarkable view of the pool and outdoor foliage. From there, the floor plan flows smoothly into an open concept living room and dining area, with clean lines leading to the state-of-the-art kitchen. A stylish and fully climatized wine cellar is another highlight of note. In the sleeping corridors are three comfortable guest bedrooms along with a magnificent master suite, complete with his and her closets and an expansive master bath. The outside living space hosts an abundance of amenities, including a full kitchen, bar and fireplace—all surrounding a truly incredible pool, which is visible from nearly every room of the home. The Guatys acted as the primary interior designers of the home and also played an extremely integral role in the process of the build. 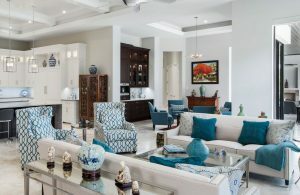 Having vacationed in the Naples area for several years, when they finally decided to purchase a place of their own, they chose Harwick because of their work and their stellar reputation in the community. The Guaty residence combines a contemporary, clean style with rich finishes to create a living experience immersed in comfort.